WILLEMSTAD - On July 2nd, the cruise ship the “Disney Fantasy” visited Curaçao for the first time. As is customary when a cruise ship visits Curaçao for the first time, an inaugural trip is celebrated with a reception on board. 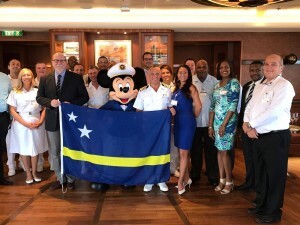 A delegation consisting of representatives of the agent of Disney Fantasy, being Maduro Shipping, together with the Curaçao Ports Authority (CPA), the Curaçao Tourist Board (CTB), the Chamber of Commerce, Customs and other stakeholders, paid a courtesy visit to the ship. During the ceremony Mrs. Sau Bridgewater-Chong, Public Relations Manager of CPA, welcomed all those present and exchanged placards and promotional gifts with representatives of Disney Fantasy. After the reception all guests received a tour of the vessel, which ended with a lunch. This cruise of Disney Fantasy cruise was a 10-day cruise, whereby Disney Fantasy visited Curaçao to evaluate the possibilities of adding Curaçao to their regular itinerary in the future. CPA, together with the other mentioned organizations, did their utmost to ensure that the crew and the passengers had a pleasant experience. Disney Fantasy has a capacity of 4,000 passengers and the interior of the vessel emphasizes all which Disney stands for, being giving young and old an unforgettable experience.